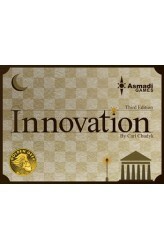 This game by Carl Chudyk is a journey through innovations from the stone age through modern times. Each player builds a civilization based on various technologies, ideas, and cultural advancements, all represented by cards. Each of these cards has a unique power which will allow further advancement, point scoring, or even attacking other civilizations. Be careful though, as other civilizations may be able to benefit from your ideas as well! To win, you must score achievements, which you can attain by amassing points or by meeting certain criteria with the innovations you have built. Plan your civilization well, and outmaneuver your opponents, and with some luck you will achieve victory! https://www.youtube.com/watch?v=aecFUhjJZN4 ..
"Mottainai" (pronounced mot/tai/nai) means "Don't waste", or "Every little thing has a soul". In the game Mottainai, a successor in the Glory to Rome line, you use your cards for many purposes. Each player is a monk in a temple who performs tasks, collects materials, and sells or completes works for visitors. Every card can be each of these three things. You choose tasks to allow you to perform actions, keeping in mind that other players will get to follow up on your task on their next turn. Clever planning and combining of your works' special abilities is key, as is managing which materials you sell. 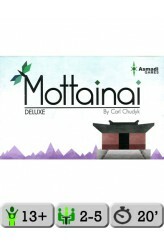 Mottainai is a deep, but quick, game experience. www.youtube.com/watch?v=SwRTPNMHzBM ..
One Deck Dungeon is a card game "roguelike" — a dungeon delve that is different every time, difficult to survive, with a character you build up from scratch. The deck consists of various foes to combat and other perils from the dungeon. Each card, though, depicts both the obstacle to overcome and the potential rewards for doing so. When you defeat a card, you claim it as either experience, an item, or a skill, tucking it under the appropriate side of your character card to show its benefits. The longer you take exploring the dungeon, the deeper you'll delve, and the difficulty will scale up quickly! If you make it far enough, you'll have to fight the dungeon boss. Survive, and you'll be a legend! 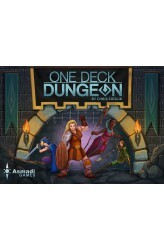 One Deck Dungeon is designed for 1-2 players. With multiple s..
One Deck Dungeon is a card game "roguelike" — a dungeon delve that is different every time, difficult to survive, with a character you build up from scratch. The deck consists of various foes to combat and other perils from the dungeon. Each card depicts both the obstacle to overcome and the potential rewards for doing so. When you defeat a card, you claim it as either experience, an item, or a skill, tucking it under the appropriate side of your character card to show its benefits. The longer you take exploring the dungeon, the deeper you'll delve, and the difficulty will scale up quickly! If you make it far enough, you'll have to fight the dungeon boss. Survive, and you'll be a legend! 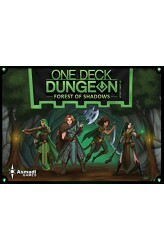 One Deck Dungeon: Forest of Shadows is a standalone expansion for One Deck Dungeo..